my garden is looking pretty too as all the beautiful bright red ‘Ladybird’ Poppies have finally started to flower on mass. They are a month late flowering this year due to lack of sun. I have already given lots of bunches away and people take one look and don’t think they are real as the red colour is so stunning!. Isn’t ‘Ladybird’ brilliant? I put in four plants this year – one died (too wet), one is about to die (too dry)… but the other two are gorgeous. I planted them next to red-stemmed silverbeet – looks pretty cool. In this, my birthday month, one of my great pleasures is to come in with armfuls of flowers for the house. The gorgeous Philadelphus “Belle Etoile” flowers don’t last long but there are always more to pick. Combined with the red roses and a few late white and yellow iris it’s a joy. Ornithogalums (spelling? )have a starry white and green flecked cluster which mix and match with almost anything. A close friend once gave me an enormous bunch of roses from her Te Awamutu garden, old fashioned and new all tumbled together in a brilliant display. It made a wonderful birthday present.Bliss. I put in 10 philadelphus plants last winter – hopefully they’ll flower next year. And I’m jealous of your ornithogalums. I love them, but have never grown them. Great cut flower though – one of the best! What is the name of that beautiful red rose of yours? Hello Lynda, I love this time of the year with the colour in the garden.— Your jugs full of blooms are bright and beautiful. For some reason, our ORNITHOGALUMS have not flowered, which is rather disappointing. 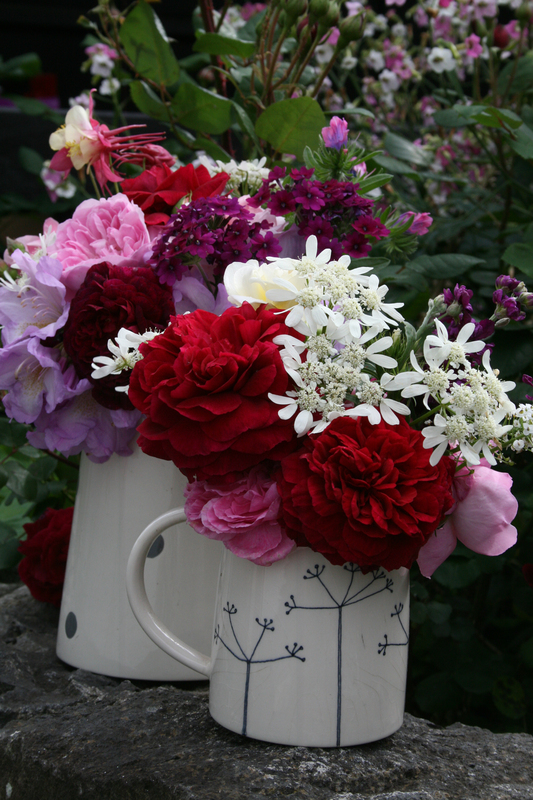 We have a great show of SWEET PEAS,and the ROSES are a picture, with red, maise yellow,( ? HARVEST MOON ? ), pink, salmon,and white colours all blending together.The CINARARIAS are almost finished, AQUILIGIAS in deep purple,IVY GERANIUMS in various colours, SOLOMANS SEAL has just finished flowering.The CAMILIAS, MOCK ORANGE BLOSSOM, WEIGELA, ARCTOTIS in 6 colours, GAZANIAS,tall PINK forget-nots,CARNATIONS and PINKS, plus other blue flowering shrubs and ROSEMARY. We have trays of seeds to germiate– and so nature does its wonderful job. Love the photo of Lucas in NZ Gardener Lynda. Forgot to say the Queen Anns Lace is so tall and pretty also. What are the lacy white blooms in your jug Lynda?Are they ORLAYA GRANDIFLORA? How tall do they grow, and spread? So dainty looking. Must get some for next year.